The University of California, Irvine suspended its Muslim Student Union (MSU) for a year after a school investigation concluded the group organized disruptions of a February speech by Israeli Ambassador Michael Oren, then lied about it. The suspension is effective September 1. The chapter must complete 50 hours of community service before it can apply for reinstatement. 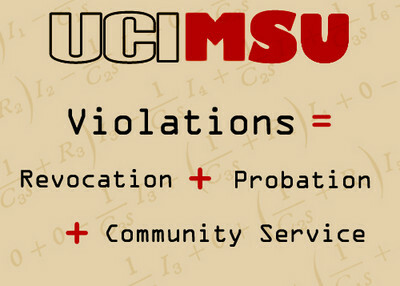 If that is granted, the MSU faces another year of disciplinary probation. In a 14-page letter dated May 27, UCI Housing Senior Executive Director Lisa Cornish detailed the findings of the school investigation. It found that MSU violated four student policies involving dishonesty, obstructing disciplinary procedures, disorderly conduct and "participation in a disturbance of the peace of unlawful assembly." Oren spoke at the Irvine campus February 8. His remarks were interrupted at least 10 different times by students who blasted him as a murderer and a war criminal. He briefly suspended his talk, resuming it only after school officials tried to restore order and repeatedly advised the audience that the outbursts violated student conduct codes. This disturbance came after school officials had met with UCI officials to express concern that an organized plan to disrupt the speech was in the works. 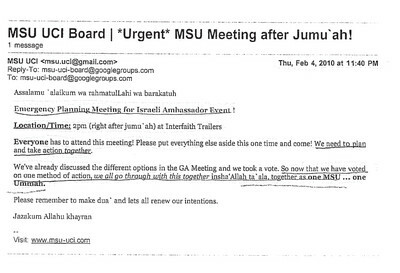 The MSU is a chapter of the Muslim Students Association, a national organization founded in 1963 by Muslim Brotherhood members who came to the United States for college education. The Irvine MSU is considered among the most extreme chapters in the country. MSU officials repeatedly denied this assertion both in public and in meeting with school officials. But the internal emails from a Google group told a different story. UCI administrators received copies of the emails in an anonymous mailing in early April. The Investigative Project on Terrorism also received a copy, and reported that one included a "game plan," describing where the student disruptors would sit, how they would communicate with each other via text messaging, and what to do if their fellow protesters were arrested. Yet MSU officials stuck to their denials when reporters asked what happened. MSU President Mohamed Abdelgany wrote on a website created to support the arrested students that, "all of my actions on Monday were done out of my own individual accord and were not on behalf of the Muslim Student Union or any other organization at UC Irvine." Chapter spokeswoman Hadeer Soliman similarly told the Los Angeles Times that "It was not put on by the MSU, but rather by students acting on their own." She repeated the claim in a column in UCI's student newspaper. UCI's investigation concluded that "the disruptions were planned, orchestrated and coordinated by the Muslim Student Union." It cited a February 3 meeting during which the goal of sending Oren a message "that he knows that he can't just go to a campus and say whatever he wants" by "push[ing] the envelope" were discussed. While the findings were reported in Cornish's letter, the investigation was conducted by a panel of school officials "who have had no prior issues with the group," said spokeswoman Cathy Lawhon. "It appears to be politically motivated to silence any future peaceful and legitimate criticism of Israel's global practices. This was nothing but a peaceful and symbolic protest of the Israeli Ambassador at UCI. It was a reflection of a growing worldwide campaign by human relations activists to end the Israeli occupation of Palestine and their racism toward the Palestinian people." Ayloush also expressed anger that the report was released publicly. Student disciplinary records are exempt from disclosure, but that protection does not apply to an organization, Lawhon said. On Monday afternoon, the MSU issued a statement acknowledging its appeal and insisting the students who disrupted Oren "acted in their personal capacity." "We cannot, we will not, we do not tolerate disruptions of academic freedom of the type that have occurred here earlier today. We cannot as a university exist with that type of behavior. It is antithetical to everything that we stand for and everything that we are. There is no university without a free exchange of ideas." The university's disciplinary actions show that the Administration meant what it said. To see the "game plan" email shared among MSU members, click here. Thanks Go to IPT for their disclosure of MSU actions at UCI. The unsung heroes are also the local community folks, who said enough was enough. Finally, finally, an islamic association in America is rebuked for its deceptions and actions. Their speech is free, just poorly arranged. Perhaps soon we shall have an honest (and well informed) discussion about the content of their speech as well as the manner of their speech. Free speech does not include the incitement of insurrection or genocide. And sharia promotion is indeed seditious, as sharia calls for the destruction of all man-made law and the imposition of "divine" sharia, an outcome antithetical to every fiber of the American soul and Constitution. It is time the islamists as well as our Congress, law enforcement and judges consider the new yelling of "fire" - be it a noun or a verb - as non-protected speech.